Garagiste Festival 2017, courtesy photo. 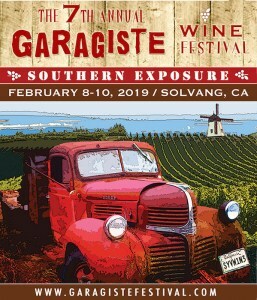 Recently named “America’s Best Wine Festival” by USA Today, the Garagiste Wine Festival returns to Solvang February 8 – 10. “Garagistes” (pronounced garage-east) is a term originally used in the Bordeaux region of France to denigrate renegade small-lot wine makers, sometimes working in their “garages” (anything considered not a chateau), who refused to follow the “rules,” and is now a full-fledged movement responsible for making some of the best wine in the world. Showcasing the wines of some of California’s best small production winemakers, the seventh anniversary festival has a number of different components, including the popular “‘Original Garagiste” seminar, featuring Central Coast winemaking legend Ken Brown of Ken Brown Wines interviewed by Garagiste Festival Co-founder and KRUSH radio host, Stewart McLennan. Brown’s winery, Ken Brown Wines, focuses on very small lots of Pinot Noir from the finest vineyards of Sta. Rita Hills. 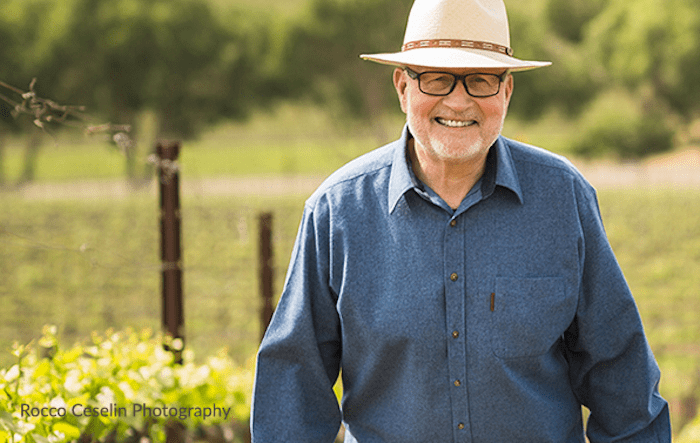 Recognized as one of Santa Barbara County’s pioneering winemakers and innovators, he was the founding winemaker at Zaca Mesa Winery and spent 20 years at Byron Winery as well. Not only was Ken Brown among the first vintners to realize the tremendous promise for Pinot Noir and Chardonnay in Santa Barbara County, he was also the first winemaker to introduce the Syrah grape, as well as Pinot Gris and Pinot Blanc, to the region. The “Original Garagiste” seminar runs from 11 a.m. – 12:30 p.m. on Saturday, February 9 and will focus on how he helped shape the Santa Barbara wine scene and why he ultimately returned to small-lot winemaking. Winemaker Ken Brown leads off the 2019 Garagiste Festival with a one-on-one discussion and tasting. Photo by Rocco Ceselin, courtesy Garagiste Festival. 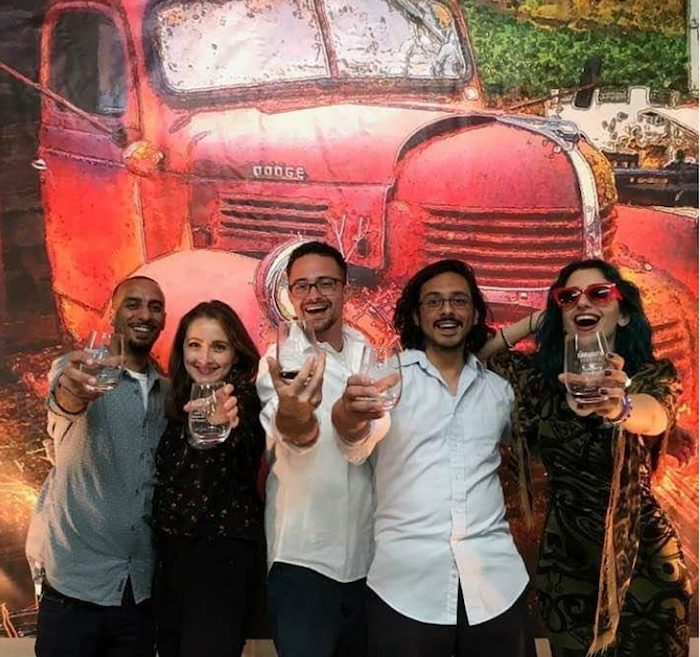 Dubbed a “tasting nirvana,” “strange and wondrous” and “one not to miss” by the Los Angeles Times, the Garagiste Festival is renowned for its renegade spirit, passionate winemakers, handcrafted wines and rules-breaking, anti-snobby ethos. The wines are poured directly by their makers, and it’s definitely one of the most fun—and accessible—festivals to talk to winemakers about their passion projects. In many cases the winemakers are employed by larger wineries but showcase their own, lovingly crafted, small batch concoctions at the Garagiste Festival. For example, Marisa Matela Beverly is Owner/Winemaker of Bevela Wines (which will be showcased at the festival), but has also been working with Au Bon Climat, Qupe and Verdad wineries since 2008. Guests can taste those end results on Friday, February 8 at the popular “No Repeats, Rare & Reserve,” tasting, where attendees can get up close and personal with the winemakers as they share limited Club Only, Library and Pre-Release bottles and Barrel samples, and enjoy a BBQ buffet from local favorite Neighbor Tim’s BBQ. Bevela is pouring a library selection of the Matela Teroldego (the 2010 vintage) as well as the current release (the 2012 vintage). “We also have a special selection of 2014 Presqu’ile Syrah, only bottled in magnum and only available to our allocation list. This wine is our silent auction item on Saturday,” says Beverly, who will be pouring her 2017 “Fractured Emergence” Chardonnay, 2012 “Matela” Teroldego, 2015 “Old Fashioned Superstition” Syrah, and 2015 “Unforeseen Alchemy” Red Blend at the Grand Tasting Event on Saturday, February 9. The Grand Tasting runs from 2-5 p.m. showcasing over 40 winemakers pouring 150+ wines and 20+ unique varieties. Among the winemakers scheduled to pour are: Ascension Cellars, Bevela Wines, Blatty, Bodega de Edgar, Bolshoi Family Wines, Byron, Camlow Cellars, Cholame Vineyard, Cloak & Dagger Wines, Copia Vineyards, Cordon Wines, Corner Cellars, Cutruzzola Vineyards, D.Volk Wines, Dascomb Cellars, DeWit Vineyard, Dracaena Wines, Elwood Wines, Ferguson Family Winery, Golden Triangle, Greyscale Wines, Hoi Polloi Winery, Kaleidos Winery, Kimsey Vineyards, Kings Carey, Lepiane Wines, Luna Hart, Maiden Stoen, Marin’s Vineyard, MCV, Metrick Wines, Montagne Russe, Montemar Winery, Nexo, Pelletiere Estate, RF Fine Wines, Ryan Cochrane Wines, Seagrape, Sycamore Ranch, Temperance Cellars, Tercero Wines, Thomas William Fermentation Company, Torch Cellars, Volatus, and Westerly Wines. All tickets include unlimited tastes, complimentary cheese and charcuterie and a souvenir Stolzle crystal wine glass—plus a Silent Auction full of enticing wine packages which benefits The Garagiste Scholarship at Cal Poly. Dana Volk of D.Volk Wines is pouring at the Garagiste Festival, and offering special discounts to festival attendees at her nearby Solvang tasting room. Photo by Bottle Branding, courtesy D.Volk Wines. On Saturday she’ll be pouring and offering special discounts on D.Volk Wines’ 2017 Curtis Vineyard Chardonnay, Santa Ynez Valley; 2017 Grenache Blanc, Dorigo Family Vineyards, Ballard Canyon; 2017 Rosé, Camp 4 Vineyard, Santa Ynez Valley; 2015 Pinot Noir, Duvarita Vineyard, Santa Barbara County; and 2016 Hampton Family Vineyard Syrah, Santa Ynez Valley. “There is a special place in our hearts for Solvang, and for the amazing small production winemakers who pour at this venue. Solvang, and the beautiful Veteran’s Memorial Hall, lend such a charming and intimate setting for attendees to chat and taste with the winemakers and owners who will be pouring their hard-to-find wines. We love the diversity of the wines poured here, with multiple micro-climates, grape varieties and innovative blends represented.” says Garagiste Festival cofounder Doug Minnick. With the exception of the Passport Day tastings, which take place at individual wineries and tasting rooms, all festival weekend events take place at Solvang Veterans’ Memorial Hall, 1745 Mission Dr., Solvang. Tickets are very limited, so if you want to go, you should act now. To purchase tickets, click here. Hope to see some of you there. Originally published in Santa Barbara Seasons on January 25, 2019. April Fools’ Day is coming soon, and what better way to celebrate the lighter side of life than one of my favorite wine festivals: the 2017 Garagiste Wine Festival: Southern Exposure. The unique thing about this event is that it showcases micro-production wines made made by garagiste winemakers, commercial artisan winemakers who handcraft under 1,500 cases a year and pay close, hands-on attention to every wine they make. Starting in 2011, the nonprofit Garagiste Festivals have introduced hundreds of outstanding artisan winemakers to thousands of passionate wine consumers, members of the trade and media, raising the profiles of many of the winemakers nationally for the first time, and raising thousands of dollars for the education of future winemakers. The festival benefits the Cal Poly Wine and Viticulture Department. “Garagistes” (garage-east) is a term originally used in the Bordeaux region of France to denigrate renegade small-lot wine makers, sometimes working in their “garages” (anything considered not a chateau), who refused to follow the “rules,” and is now a full-fledged movement responsible for making some of the best wine in the world. Saturday, April 1: Seminars 11 a.m.-12:30 p.m.
“What’s Wrong With This Picture? Educate Your Palate About the Most Common Wine Flaws” moderated by winemaker and festival co-founder Stewart McLennan, is led by Marcy Mallette, Winemaker/Technical Representative for Laffort USA. “An Exploration of Grenache: Not Just for Blending Anymore” featuring Zac Wasserman (Frequency Wines), Sonja Magdevski (Casa Dumetz) and Cris Carter (Weatherborne), along with their wines. Saturday, April 1: Grand Tasting 2-5 p.m.
Sunday, April 2: Passport Day, where, for the first time ever, local Santa Ynez Valley wineries will be offering special opportunities for Garagiste Festival attendees. Vineyard tours, winery tours, barrel samples, free and discounted tastings, discounted pricing and club-member-for-a-day benefits are just some of the treats being offered by participating wineries. Get ready for a comfortable and relaxed tasting experience with personal winemaker interaction, high quality wines, first-time and soon-to-break-out discoveries (*seven winemakers will be pouring for the first time), diverse grape varieties and a renegade and fun-loving spirit on display. Winemakers scheduled to pour include: Artisan Uprising, Ascension Cellars, Bevela Wines, Bradley Family Wines, Brian Benson Cellars, Camlow Cellars, Carivintas, Carter Paul Wines*, Casa Dumetz Wines, Central Coast Group Project, Cholame Vineyards, Cloak & Dagger Wines, Clos des Amis, Coda Wines, Comartin Cellars*, Cordon Wines, Dascomb Cellars, El Lugar Wines, Frequency Wine Co., Golden Triangle, Iter Wines, Jalopy Wine Company*, Jamie Slone Wines*, JP3 Wines, Kaleidos Winery, Larner Vineyards, Levo Wines, Mallea Wines, Mattina Fiore, McKinney Family Vineyards*, MCV Wines, Metrick Wines*, Mollie Wines, Montemar Winery, Ryan Cochrane Wines, Seagrape Wine Co, Serrano Wines, Skyenna Wines*, Tercero Wines, Turiya Wines, Weatherborne and West of Temperance. Tickets are very limited and Garagiste Festivals always sell out. To purchase tickets and for more information, visit http://garagistefestival.com. Originally published in Santa Barbara Seasons on March 24, 2017. Wine and romance pair together so well, why not celebrate Valentine’s Day weekend at the fourth annual Garagiste Wine Festival Southern Exposure 2016. This fun and very unique wine festival takes place Feb. 13-14 at the Veterans’ Memorial Hall in Solvang. In honor of Valentine’s Day weekend, the festival features micro-production local sparkling wines, in addition to handcrafted red and white vintages poured by hard-to-find, cutting-edge commercial artisan garagiste wineries from Santa Barbara County, Santa Ynez Valley, Paso Robles, Napa and more. Not only is this an ideal way to try hard-to-find, up-and-coming wines (and meet their makers), proceeds from the event benefit The Garagiste Festival Scholarship Fund at Cal Poly Wine and Viticulture Department. The Los Angeles Times calls this a “wildly exuberant and fun wine event,” and I couldn’t agree more. (Click here for a previous Cocktail Corner about the event.) The event features Grand Tastings of different vintages on both Saturday and Sunday. In addition, each Grand Tasting is preceded by a tasting seminar. From 11:30 a.m.-12:30 p.m. on Saturday they’ll be Digging Deep into Mourvedre: This seminar explores different styles of Mourvedre and helps you understand why it is one of the most widely planted varietals in the world. Bob Tillman (Alta Colina Vineyards), Larry Schaffer (Tercero Wines) and Eric Mohsemi (Zaca Mesa Vineyards) will explain the joys of this under-the-radar grape as you taste your way through an amazing array of Mourvedre’s to showcase what this grape brings to the bottle. Sunday’s seminar, from 11:30 a.m.-12:30 p.m. and sponsored by BubblyFest, is called Rise of the Bubbles – The New Breed of California Sparkling Wine: Start Valentine’s Day off right by tasting some of the exciting new bubbles—white, pink and red—that are being produced by small winemakers in California. You’ll explore the wines of Norm Yost (Goat Bubbles), Tyler Elwell (Halcyon Wines) and Dan Kessler (Kessler-Haak Vineyards). Launched in Paso Robles in 2011, the nonprofit Garagiste Festivals were the first to shine a light on the American garagiste winemakers, commercial artisan winemakers who handcraft under 1,500 cases a year and pay close, hands-on attention to every wine they make. To purchase tickets and for more information, go to: http://garagistefestival.com. Winemakers scheduled to pour include: Archium Cellars, Ascension Cellars, Baehner Fournier Vineyards, Bevela Wines*, Brophy Clark Cellars, Carucci Wines, The Central Coast Group Project, Cloak & Dagger Wines, Clos des Amis, Coda Wines, Cordon Wines, Dascomb Cellars, El Lugar Wines, Graef Wines, Halcyon Wines*, Iter Wine*, Kessler Haak Vineyard, La Montagne Winery, Larner Vineyard, Levo Wines, Mallea Wines*, MCV Wines, Millesime Cellars*, C. Nagy Wines, Pace Family Wines, Press Gang Cellars, Rhythm Wines*, Ryan Cochrane Wines, Scott Cellars, Seagrape Wines, small + tall wines*, Stirm Wines*, STANGER/JP3, Tercero Wines, Travieso Winery, Trojak-Knier Winery, Weatherborne, West of Temprance* and Workman Ayer. Originally published in Santa Barbara Seasons Magazine on January 22, 2015. Purely by coincidence, I spent the last two weekends tasting a number of limited production wines—while the number of bottles may be small, their variety is large and their quality is excellent. First up was a lovely tour, barrel sampling and wine tasting at the Santa Ynez estate home of Westerly Wines. What a treat! Winemaker Adam Henkel played host for the private event. He’s a Kentucky-born charmer who came to the vineyard a few years ago, after a decade in Napa Valley making wines for Harlan Estate and Swanson Vineyards. Westerly Wines Winemaker Adam Henkel with one of the ceramic “eggs” used in the white winemaking process. Photo by Leslie Dinaberg. First of all, the estate is beautiful. Based in the Happy Canyon of Santa Barbara AVA, it was once part of a 3,900-acre horse ranch, Westerly Stud Farms, and horses still graze the neighboring estates. Our first wine was a 2013 Westerly Sauvignon Blanc, a bright, fresh and balanced wine that was perfect for a warm, spring afternoon. Then Henkel took us into the barrel room, where we sampled the 2014 Sta. Rita Hills Chardonnay and the 2013 Sta. Rita Hills Pinot Noir, both of which were quite promising. This winery is state-of-the art, with reds fermenting in concrete conical tanks, French Oak and traditional stainless steel, while the whites cold ferment in concrete “eggs,” as well as small French Oak barrels and stainless steel tanks. It’s amazing the number of different winemaking vessels available, and Westerly seems to have them all on hand. Then it was onto the picturesque dining room, where owner Roger Bower greeted us warmly. At lunch we tasted an excellent Bordeaux varietal, the 2010 Westerly Fletcher’s Red, a blend of Cabernet Sauvignon, Merlot, Petit Verdot and Cabernet Franc. We also tasted the 2012 Cote Blonde, a blend of 87% Syrah and 13% Viognier co-fermented together to create my new favorite wine. It’s really nicely balanced and full bodied with a wonderful smell of dried apricots of flowers. Trust me, it’s delicious! It was a great introduction to these (new to me) wines. I definitely won’t be a stranger! 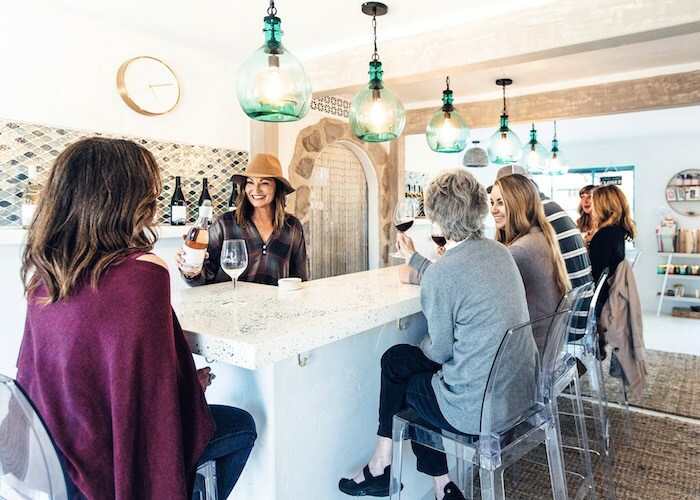 The winery is not open to the public, however wine club members are invited to special events and staff will be pouring at a number of upcoming wine festivals, including the 2nd Annual Santa Barbara Food & Wine Weekend at the Bacara Resort & Spa April 16-17. Click here for details. Speaking of festivals, if you want to know what’s new and exciting in the world of wine, the Garagiste Festival is the place to be. Named for the GARAGISTES (gar-uh-zhē-stuh), which comes from a term originally used in the Bordeaux region of France to denigrate renegade small-lot wine makers, sometimes working in their garages, who refused to follow the “rules” of traditional winemaking, the festival focuses on producers of less than 1,500 cases, which means these are wines you are unlikely to find very easily. The Solvang festival had two days of Grand Tastings, with different wines poured a each one. One of my favorites was the 2012 Sta. Rita Hills Chardonnay from Seagrape Cellars, which is a side project for Buttonwood Farm Winemaker Karen Steinwachs (started with her late husband, Dave). Another festival fave (I was focused on whites) was Baehner Fournier Vineyards 2013 Sauvignon Blanc from Vogelzang Vineyard in Happy Canyon. This is the special rose flight from Wine + Beer, photo courtesy JZPR. Liquid Farm “Vogelzang Vineyard,” Happy Canyon, made from 100% Mourvedre. Tasting flights are only available through next week, but the wines—so perfect for spring —are all for sale by the bottle in this bustling tasting room. Cheers! Click here for more cocktail corner columns. Originally published in Santa Barbara Seasons on April 3, 2015. There’s no shortage of fun wine, beer and cocktail events in Santa Barbara County, but the next few weeks are particularly eventful. Indulge in the pleasures of Pinot Noir at the beautiful Bacara this spring, when the 15th Annual World of Pinot Noir unites producers from the most exceptional and unique regions in the world with Pinot Noir enthusiasts for a weekend of celebration and education. Last year’s event set a high bar for wonderful wines. Sip and savor at the Bacara Resort & Spa, 8301 Hollister Ave., Goleta, 805/489-1758, worldofpinotnoir.com. Celebrate the 23rd year of “Taste of Solvang” Food & Wine Destination Weekend with a five-day experience that encourages attendees to embark on “a culinary journey through Solvang, where wine country meets ‘dine country.” Highlights include the ​two-day Taste of Solvang Wine & Beer Walk, which allows guests to taste their pick from more than a dozen participating wine tasting rooms, wine bars and beer bars during the two-day stroll through Solvang Village. In addition, there’s a special Winemaker Dinner in a greenhouse setting with local winemaker and vineyard owner, Michael Larner of Larner Vineyard & Winery, and a carefully-curated pairing menu by Bacon & Brine’s Chef Pink. New this year is Bubbles & Brunch, an exclusive brunch held at Solvang’s Wildling Museum, featuring three different sparkling wines from local label, Flying Goat Cellars’ “Goat Bubbles” – a Blanc de Blancs, Blanc de Noirs, and a sparkling Rosé. Flying Goat Cellars Winemaker, Norm Yost, is available to walk guests through each sparkling wine and the sparkling winemaking process. Various locations throughout Solvang. Tickets are available at solvangusa.com/tickets, and for further information, visit solvangusa.com/tos. This popular festival returns to Veterans’ Hall in Solvang for what Festival co-founder Stewart McLennan promises will be “our best Southern Exposure ever—with many more exciting wine discoveries on tap from Santa Ynez Valley and Santa Barbara County.” The weekend of events will showcase the wines of over 60 artisan garagiste commercial winemakers who produce under 1,500 cases per year from the Santa Barbara region and the Central Coast. As an added benefit, the nonprofit Garagiste Festivals benefit the Cal Poly Wine and Viticulture program. For more information on The Garagiste Festivals, go to http://garagistefestival.com. Now in its second year at the Bacara, the Santa Barbara Food & Wine Weekend showcases the distinct tastes, sights and sounds of Santa Barbara County while also bringing cutting-edge culinary talent from across the country to our region. This multi-faceted event, which includes cooking classes with famed chefs, local wine and food tastings, movie screenings, special presentations and much more, is a benefit for The Julia Child Foundation for Gastronomy and the Culinary Arts. Among the highlights this year is a special dinner with actor/winemaker Kurt Russell on April 18. Bacara Resort & Spa, 8301 Hollister Ave., Goleta. BacaraCulinaryWeekend.com. When the sun goes down on Saturday’s Earth Day celebration, a large community table pops in front of the main stage immediately after the last band. The only activity in the park with an admission fee, this four-course locavore feast—a benefit for Community Environmental Council—features seasonal delights from New West Catering and Cultivate Events, as well as local wine pairings and live music. This limited-seating special event will sell out, so get your tickets early. | Alameda Park, 1400 Santa Barbara St., 7 p.m. For tickets contact Kathi King at 805/963-0583 ext.108, or visit SBEarthDay.org festival-highlights/farm-to-table-dinner. Join the Parks and Recreation Community Foundation (PARC) for its third annual fundraising bash, Magic on the Urban Wine Trail, where music, art and wine meet. Enjoy an afternoon of wine tasting featuring more than 12 wineries from the Santa Barbara Urban Wine Trail, while you mingle with friends, enjoy local art and music and feel great about supporting Parks and Recreation programs for under-served youth. There is also a silent auction, raffle and bottles of favorite wines for purchase. Carrillo Recreation Center Ballroom, 100 E. Carrillo St., 3-6 p.m. 805/897-1946, parcsb.org. Hope to see some of you there. Cheers! Click here for more cocktail corner columns. Originally published in Santa Barbara Seasons Magazine on March 6, 2015.